Idaho’s Air National Guard was established in 1946, and has quietly celebrated more than a half-century of volunteer service to Idaho and the nation by thousandsof citizen-airmen. The state’s first Air Guard unit, the 190th Fighter Squadron, was created Oct. 13, 1946, under the command of Lt. Col. Thomas G. Lanphier, the pilot credited with downing the bomber carrying Japan’s Admiral Yamamoto in the South Pacific during World War II. Like Lanphier, most of Idaho’s early airmen were veterans of the war. The volunteers — 23 officers and 44 enlisted men — met one night each week in a small building on Fort Street in downtown Boise. Recruiting new members for the fledgling fighter squadron had the highest priority. Pay was low — $10 per month for enlisted members — and, without airplanes to fly, there was little for unit members to do during their weekly training periods. The 190th Fighter Squadron’s first airplane was the famous P-51D Mustang, which became the F-51D in 1947 when the Air Force reclassified former pursuit aircraft as fighters. The squadron moved to Gowen Field, a former Army Air Corps training base south of Boise’s Air Terminal, in 1947. Idaho’s citizenairmen have shared local runways with commercial and general aviation ever since. In 1950, the airmen and their Mustangs were called to active duty — the only full-scale mobilization in the Idaho Air Guard’s history — to replace Air Force units sent to Korea. Idaho entered the jet age in 1953, trading aging Mustangs for the F-86A Sabre Jet, America’s first swept-wing fighter. The 190th, part of the U.S. Air Force’s Air Defense Command, changed aircraft four more times over the next 23 years to fly the F-94 Starfire, F-89 Scorpion, F-86L Sabre Jet and F-102 Delta Dagger. In 1975, the 190th Fighter Squadron changed its name and mission to join the newly-formed 124th Tactical Reconnaissance Group as the 190th Tactical Reconnaissance Squadron, flying the F-4 Phantom II jet, a Mach 2 two-seat twin-engine fighter. Phantom jets would eventually spend 20 years on Gowen Field, longer than any other aircraft in the history of Idaho’s Air National Guard. Idaho’s first Phantom, the unarmed RF-4C, carried high resolution cameras and electronic sensors, which soon proved their worth to thousands of people in Idaho. Phantom jets tracked flood waters pouring from the ruptured Teton Dam within hours of the dam’s collapse to show officials where flood waters were headed in time to warn people living in endangered areas. Aerial photographs taken immediately after the Challis earthquake helped emergency response crews locate and evaluate damage. Idaho aircrews excelled in their military mission as well. Two Idaho fliers were named “Best Aerial Reconnaissance Aircrew” at an international competition. The 124th was named “Best Flying Unit in the Air National Guard” and received the prestigious Spaatz Trophy from the National Guard Association. Idaho airmen and Phantom jets went to Canada and Norway to provide critical tactical reconnaissance capabilities to U.S. and NATO forces. In 1991, Idaho’s Air Guard changed aircraft and mission again. The unarmed RF4C Phantom jets were replaced by F-4G Wild Weasel fighters. 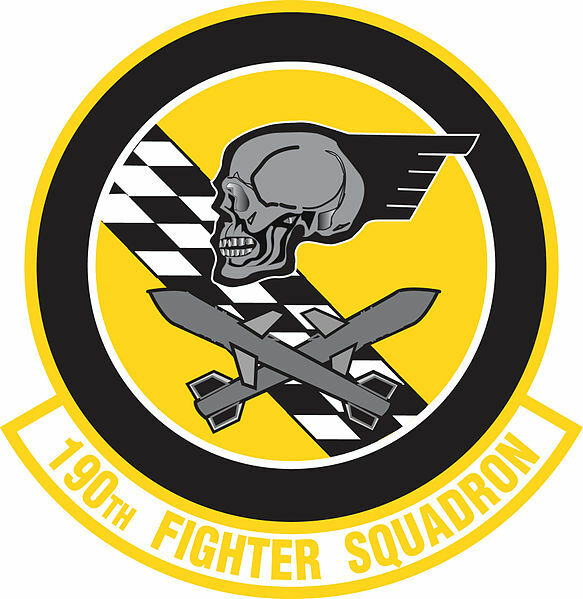 The 124th Tactical Reconnaissance Group became the 124th Fighter Group, a reserve component of the U.S. Air Force’s Air Combat Command. In 1993 Idaho’s Wild Weasel jets were sent to Southwest Asia to support Operation Southern Watch, enforcing the no-fly zone over southern Iraq. Twice Idaho airmen were challenged by illegal Iraqi air defense radar. The threats were answered — and silenced — with antiradiation missiles. The 124th earned the U.S. Air Force Outstanding Unit Award — presented to the unit personally by the Secretary of the Air Force — for its role in Operation Southern Watch. Less than six months after ending its first Southwest Asia tour, the 124th began a second Southern Watch deployment, followed by two back-to-back tours in support of Operation Provide Comfort, enforcing the northern no-fly zone and protecting Kurds from Iraqi aggression. From 1993 to 1995 Idaho’s airmen served more than a year in the volatile Persian Gulf — longer than any other flying unit in the Air National Guard. In 1995, the 124th Fighter Group became the 124th Wing, with 18 units — two flying squadrons and 15 support units at Gowen Field and an electronic combat training range control squadron assigned to Mountain Home Air Force Base, Idaho. The wing traded its Wild Weasels, the last in the U.S. Air Force, for two new aircraft — the A-10 Thunderbolt II, better known as the “Warthog,” and the C-130 Hercules transport. The Warthog, famous for its success against Iraqi armor in the Gulf War, provides close air support to troops on the ground. Idaho’s A-10s proved their worth during Operation Allied Force in 1999, where our pilots flew hundreds of combat missions in NATO’s battle for Kosovo. The C-130, workhorse of military air transport worldwide, is used to move people andcargo into and out of rough, undeveloped airfields. Idaho’s Herks have flown flood relief missions in northern and eastern Idaho, delivered hay to starving cattle and carried several California Condors, an endangered species, to safety at the Birds of Prey center. The new century brought a new focus for the 124th Wing. As part of the Aerospace Expeditionary Force established by the Air Force, the Idaho Air Guard took part in AEF 7. Nearly 500 Idaho Air National Guard members went to Kuwait, Oman and other countries throughout the region over a three-month period in the summer of 2000. Changes and challenges of the past half-century have consistently produced positive results, thanks to the dedicated efforts of thousands of men and women who have served Idaho and America since 1946 as members of the Idaho Air National Guard.